Posted February 22, 2017 by Josette Farrell in News. 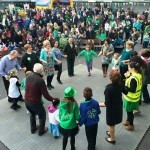 St. Patrick’s Day falls on a Friday this year and the St. Patrick’s Day committee who have run the courtyard event for the past two years would like to open the event up to as many local clubs, societies, schools, groups and businesses as possible to help keep people local and in the community for the weekend and to have a fun itinerary on the day between 12pm and 3pm. 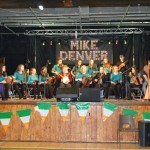 They are hoping to run the St. Patrick’s Day Irish music and dance event in the courtyard behind Hughes SuperValu again and hopefully add more entertainment with as many children as possible showcasing their talents as possible. The organisers would also like to get local businesses involved in promoting any other events, entertainment and offers they have going on for the weekend to keep the festivities going for the weekend. 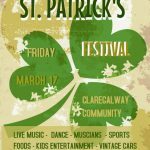 The organisers are having a short meeting on Monday night in the Claregalway Community Centre at 8pm and invite everyone who has an interest in St. Patrick’s Day – weekend in Claregalway to attend. No major commitment is required, just ideas and/or a helping hand. Special Guest will be St. Patrick, arriving by Pony & Trap however is making every effort to attend this very important Festival and to be with our Community. Face Painting & Nail Art Designs – Balloons Display. 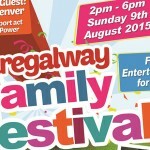 Art & Craft by – Claregalway Community. Claregalway Cubs & Scounts – Show case Activities in pioneering knots. Claregalway Historical Socitery & Lackagh Musem. Big Thanks you to all Musicians & Dancers that performed on stage.